Even though it’s a construction site, it’s still very colorful and themed thanks to the image on the tarp. For the last few years I’ve noticed some big improvements in maintenance on the buildings at the Magic Kingdom. There are literally managers who walk around with a camera and voice recording taking pictures of work that needs to be done and recording notes. Then when I come back a few weeks later, that problem has been fixed. That’s how it should work. The whole park has been working on upgrading everything from facades to sidewalks. You couldn’t miss it if you visited the last few years, inevitably there would be some building shrouded in a giant tarp. 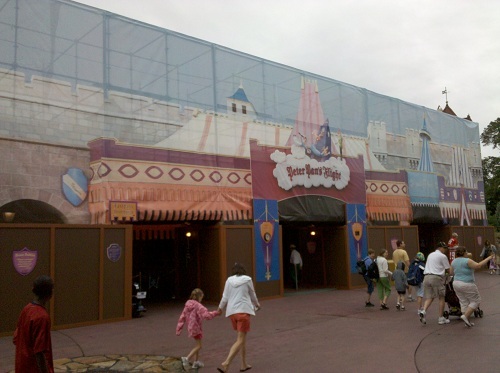 But you might look twice once you noticed it, as Disney has taken to printing giant pictures of the buildings being repaired on the outside of the tarp. It doesn’t make them go away, but at least guests can tell that Disney cares about their experience. For many years if you had a family of 5, 6, or more you were forced to either book two rooms, a suite, or a cabin at Fort Wilderness. Spurred by the Nickelodeon Suites, Disney has recently added some family suites to the All Stars and Pop Century. These typically cost a bit more than a standard room, but less than renting two rooms and sleep a family of six. Now Disney has announced that the Art of Animation Resort will have over 800 family suites. This is a wonderful move, and it’s location right across the street from ESPN WWOS is sure to attract more complete families who will come and visit WDW while one of the family competes in their sport. For a long time I encouraged Disney to jump with both feet into the world of blogging and other social media. Just over a year ago they took that plunge and the results have been outstanding. 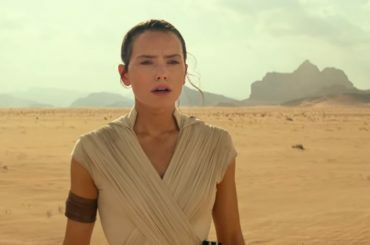 There is now more information coming direct from Disney to its fans than ever before. There’s still a lot of work to do, but they’re definitely on the right path. Let’s include in this the Disney World Mom’s Panel. They amount of buzz, goodwill, and groundswell momentum they’ve gotten out of this is immeasurable. Disney’s still experimenting with the model, but I think it’s a good one for the long term. I’ll also include fan and social media out reach in here. The crew that coordinates media events goes out of their way to include some of the blogs and websites that have great relationships with their fans. This is very cost effective marketing for Disney. More of these and closer collaboration should be considered in the future. 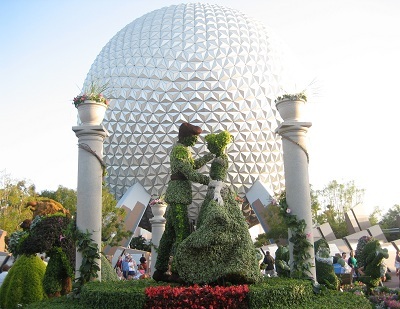 The 2009 entrance topiary for the Flower and Garden festival. 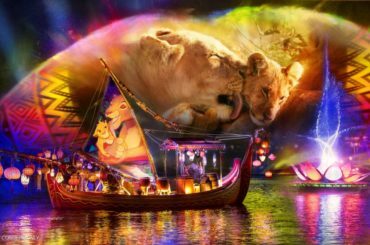 While the Flower and Garden Festival and Food and Wine festival are old favorites, Disney has found a way to keep them fresh and exciting year and year. They continue to draw huge crowds to EPCOT at times of the year when things would otherwise be slow. I’m also going to throw the Holidays in here. Disney owns Christmas around here and has a rather sizable chunk of Halloween. 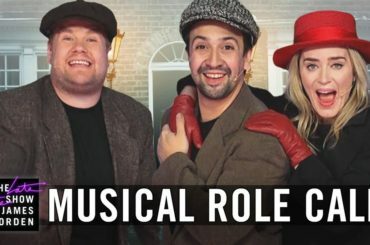 I think they could do more here (like bring back the Easter Parade) but they’re definitely on the right path. Then there are the smaller festivals. Star Wars Weekends are extremely popular. Festival of the Masters is a wonderful weekend event. And Disney’s made a real name for itself with the Endurance Running series, the largest of which are now weekend long heath festivals. 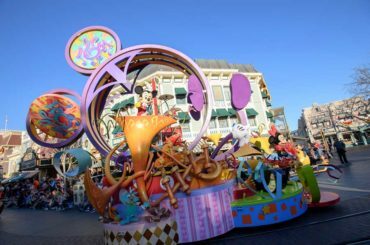 The more Disney can leverage these festival type events, without cannibalizing other events of hotel bookings, the more repeat business they’ll get year after year. And that’s a good thing for Disney. Perhaps inspired a little by the Star Trek level technology that’s rumored to be part of this new secret project headed by former EPCOT Vice President Jim McPhee, the undercurrent of every rumor at WDW is Project NextGen. What is Project NextGen? Well we don’t rightly know for sure. But the rumors are pretty exciting. 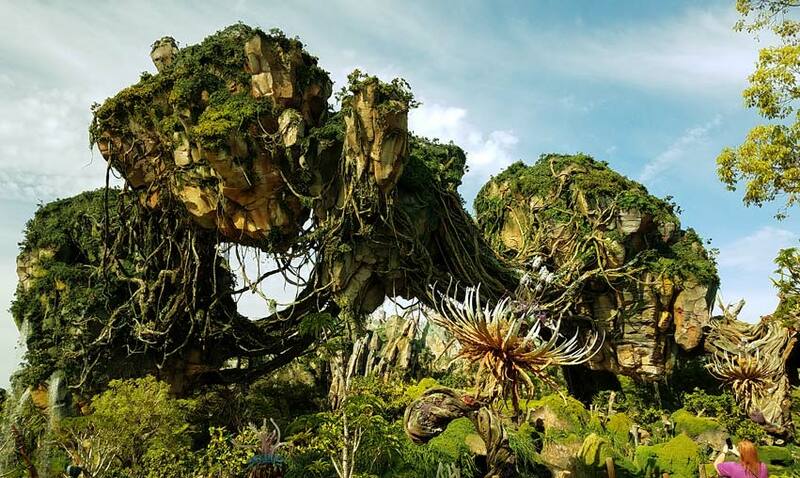 There’s no official word on exactly what NextGen will bring, but it promises to revolutionize the way guests experience a vacation at Walt Disney World. 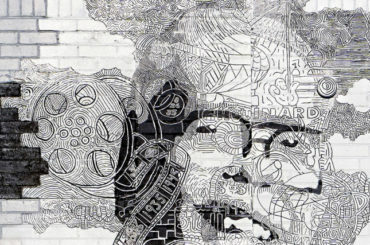 Rumors have the project involving some sort of wireless technology, GPS location, augmented reality, virtual reality, RFID chip, live character initiative, or some combination of the above. If Disney can deliver on NextGen, at a price that’s affordable or even at a cost savings for the company, then these next ten years will be pretty exciting. 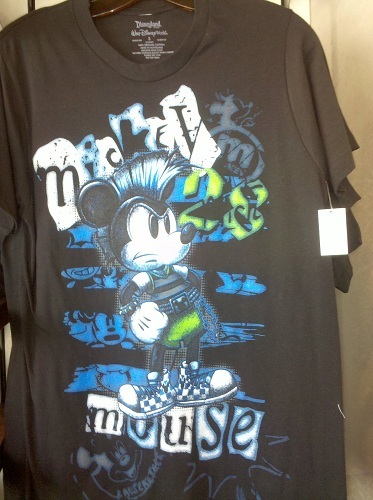 Disney’s T-shirt design team keeps new concepts coming that are surprisingly in touch with fashion trends. The Living Character Initiative – please bring back the Muppet Labs! Toy Story Midway Mania – adding in new scenes is a great thing. 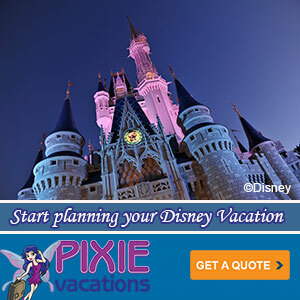 Disney can even do holiday overlays. Animal Conservation – Disney’s Animal Care program and the Walt Disney Conservation Fund has done so much good for endangered species it’s hard to even wrap your mind around. It’s walls everywhere in Fantasyland. 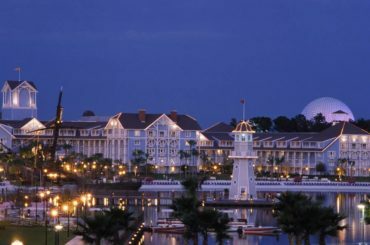 Four Seasons Hotel and Villas – Outsourcing the Luxury Resort may yet turn out to bite Disney in the you know what. But they didn’t seem to be able to pull it off themselves (I don’t think they ever really tried myself). As for the million dollar homes, well if you’re rich right now, you haven’t even noticed the down economy, so that will probably work fine. 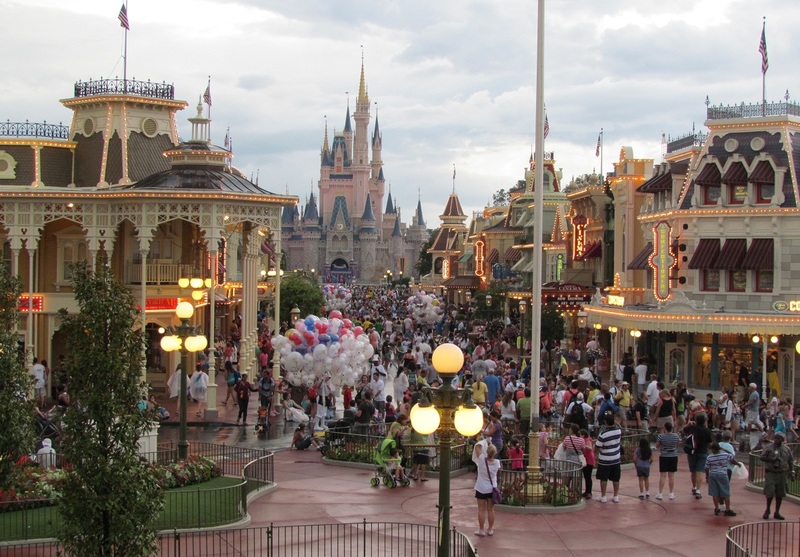 Fantasyland expansion – This is a big gamble for Disney. 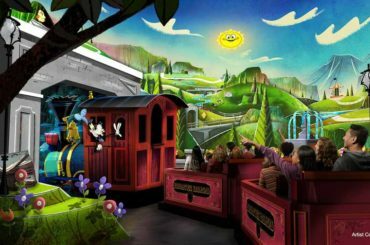 Phase one is one new ride, one innovative dining experience, and about a half dozen new character meet and greets/mini-shows. 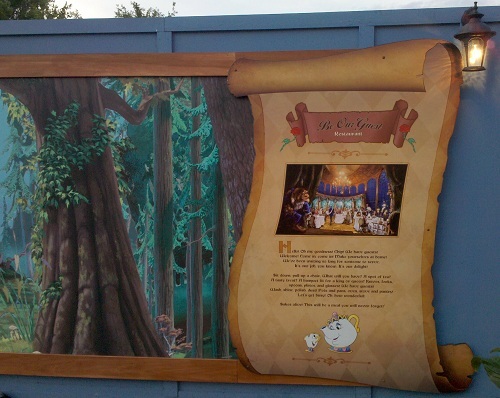 Will that capture the hearts and minds of Magic Kingdom guests? Or are they simply picking the least expensive option here. Vinylmation – Disney Pin Trading, which has been amazingly lucrative for Disney since 1999 or so, hit the 10 year mark and started a rapid deceleration. Vinylmation appears to be Disney’s attempt to reignite the collector’s passion. Will it have it’s own 10 year span? Or is it a flash in the pan. Please chime in below with the things you see Disney doing right or areas where you think the jury is still out. Postscript: I really really wanted to include ‘The Cast Members’ on this list. There are certainly excellent cast members that go out of their way to make a difference with the guest experience. But an increasingly large percentage of the cast doesn’t seem to realize they’re part of a show that’s being put on for the benefit of the paying guests. It’s just another job for them. I chalk this up to a combination of reduced training on Disney traditions and the expanded size of Disney’s cast. I hope that when I re-do this list next year, I can add “Cast Members Make the Magic” in above.